WhoSampled and The Great Escape Festival in Brighton put on the world’s first “Samplethon” in conjunction with Boosey & Hawkes and SoundCloud. 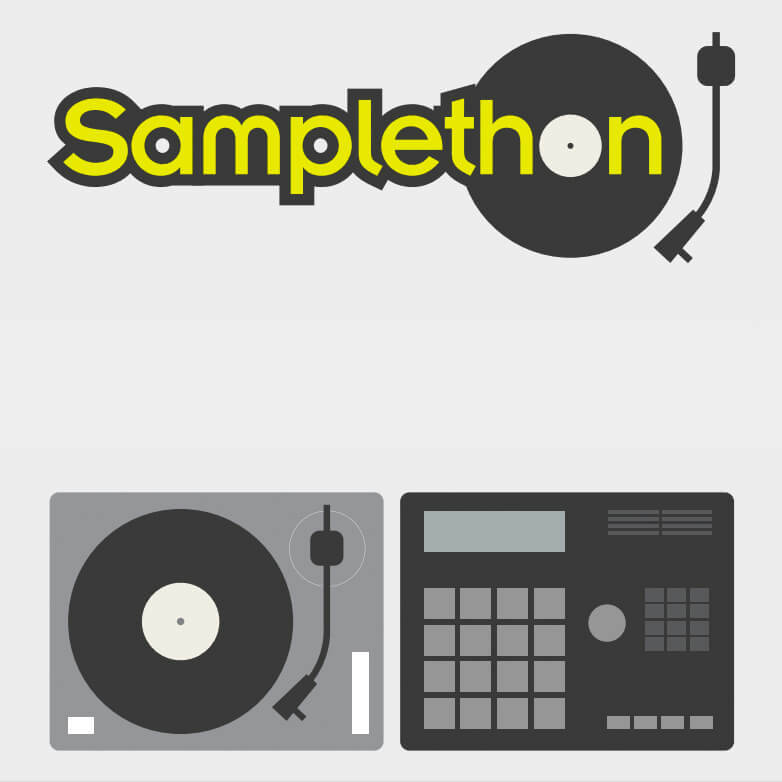 People from all over the world applied to participate in the Samplethon and only 20 participants where chosen. I feel blessed to say that I was one of them and what a day it was. It all started on a bright, wet and windy Saturday morning at 7:30am (which for a Saturday is almost unheard of for me). I reached the venue, where I was warmly greeted by Eddy Spirit, a member of the WhoSampled team and also a dope producer I later discovered. Once I registered, all the participants were given a USB drive with over 4GB of rare samples, spanning all the way back to the 1930’s. It was an absolute goldmine but the vast selection was quite daunting. Onlookers from The Great Escape Festival must have thought we where all borderline insane, a room full of guys bopping their heads pulling all sorts of samplefaces. The set ups where varied, from full pianos to MPCs, MPDs and even some SP404’s alongside my own weapon of choice, the Maschine. I was sat on a table with StayReal, Swimful Buterfly and one of the eventual winners Danny Drive Thru and we had a great talk about how the Samplethon came about and the synergy between Boosey & Hawkes and WhoSampled from founder Nadav Poraz and Arun Sethi. We were then given 6 hours to go through the samples and create something special before joining our mentors for the day – Suren Seneviratne aka My Panda Shall Fly and Gal Moore (Jazzsteppa) providing useful insights along the way. I met a whole host of dope producers included School Of Thought, DJ Wax On and BRXTNFNK amongst others but I was the one up first to showcase my final beat alongside the original sample. Needless to say it was a nerve wracking experience. The standard was very high and we all got some great feedback. Ultimately, the best 3 tracks won. Sleepless, Danny Drive Thru and Illiterate took the win and School Of Thought, Innovnace and Paradise Scientist received special mentions for their creativity. Everyone in the room – judges and all – just started bopping our heads. It was a shut down. Everyone brought there A Game to the event but the winners deserved their prize. Illiterate knew from the moment he played his beat it was within his grasp, while Sleepless, after hauling his entire setup from his home in South London (Mac and Maschine Studio) served up a banger despite early trepidation over what to bring to the table. Danny Drive Thru was a true trooper, having been at work on the Friday, heading straight to London for a gig then back on a train for the Samplethon on a few hours sleep. His reward – another gig afterwards. We were then treated to a display of the Alphasphere, a Tai Chi-inspired MIDI controller as part of the next generation of controllers. It takes the natural form of a sphere and combines with specially designed trigger pads for a different dimension of music creation and performance. We soon migrated to a pub called The Fish Bowl where I used to frequent in my uni days and the decks were set up for everyone to show off the rest of their material (special mention to 2econd Class Citizen for his crazy Maschine performance). I got my time and I played some tracks, spat some bars and represented Sampleface to the fullest. It was a great evening with good vibes and great company. I would like to thank everyone involved, all the judges and most importantly all of the Sampleface fam who supported. You can stream two of the three tracks that won below and link to the group where the participants will submit all of their tracks over the coming days. What a wonderful idea! I think using a service like Blend or Splice would allow people do this across the world!